Can you see what we have to contribute? The feminine perspective is one that can be held by both men and women, but over millennia it has tended to become marginalized, ceding ground to a fragmented view and the drive for conquest. And we, we women, have accepted this, even though by doing so we know that we are collectively discounting our essential values. Furthermore, we have made the effort to adapt to what is happening and to buy into the ‘rules of the game’, even though the result has been unsatisfactory. As a result, we have stopped listening to our intuitive, deep, wise voice. His Holiness The Dalai Lama anticipated that “the world will be saved by the Western women”. 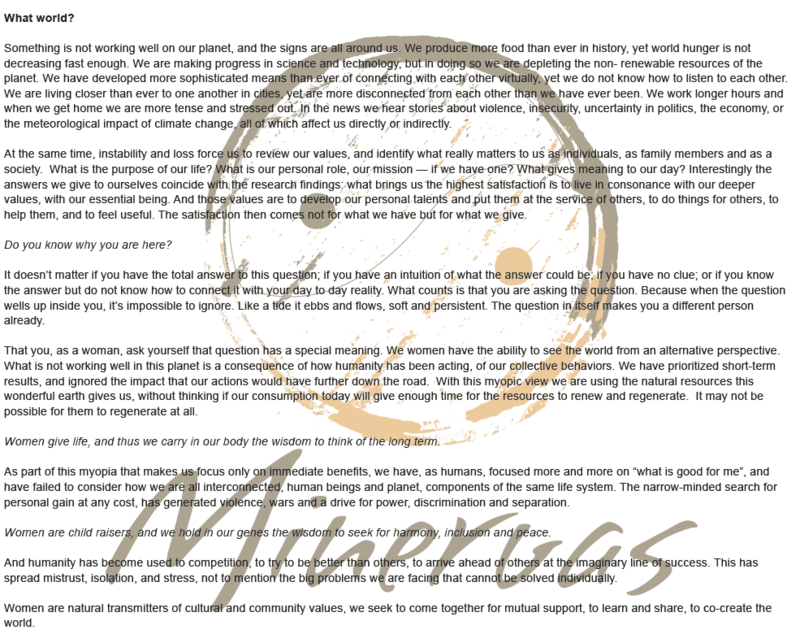 We Minervas believe it will be saved “by women”. We believe that we women have the wisdom and perspective that the world urgently needs. We can find it in ourselves as soon as we pause for a moment, and we have the ability to bring it to other people’s awareness. This wisdom is not complex, nor is it restricted to professionals or academics. It is an ancestral wisdom that we all carry in our DNA but we have forgotten how to activate it and bring into our day to day existence. It is a wisdom that is independent of race, age, educational level, money, religious belief or language. It’s a wisdom that invites us to listen to each other, to connect through empathy and compassion, to focus on where we are similar, on what we have in common, rather than on what makes us different and what separates us. It is a wisdom that seeks collaboration and the integration of differences. It seeks to solve problems today, but is mindful of the long term future as we make our decisions. It seeks the common good over individual gain. It seeks to understand, integrate, include, forgive, accept and forget. It seeks in Nature the answers to our questions. That is the wonderful and urgent contribution we women have to make. The first step is to become aware of this strength we have, of what we are carrying inside us. It is enough to pause, to be silent, and look inside, or observe the natural beauty that surrounds us. The message comes both from the inside and from the outside. It is a subtle, almost imperceptible message in the beginning. We may think we don’t hear anything, or we may doubt that we have found “it”. We may find it when we learn to notice the energy circulating in our body, or the magnetic field surrounding our body, or the voice of intuition. Do not worry if you are not certain that you can hear it, because we are not trained to hear it, but we can re-learn it easily, since we had it before we communicated with words. Once we learn to listen to our inner wisdom, the next question is what we do with it. It is our privilege and opportunity to contribute a new perspective to the world. First, noticing in what moments during the day we are living up to those values, and when we don’t. Slowly, we can try to make the adjustments to live more and more in sync with what we know and what we do. That way our mere presence becomes a bright signal for our surrounding, wherever we go and whomever we are with. Because when we live in sync with our wisdom, our actions, decisions and interactions are a silent but illuminating beacon. At the same time we become “transporters”, because when we have an attitude of reconciliation, a long term perspective, an openness to dialogue and respectful listening, when we show affection and forgiveness, personal accountability and empathy, compassion and collaboration, inclusion and integration of differences, when we point at how all are one, then we are changing the world. I pay attention and learn to listen to the voice of wisdom I carry in my inner being. I observe my daily actions and review those that are not in sync with my wisdom. I work on my personal development to make my actions and words a visible expression of my values. I reflect on what I contribute to what is happening to me. Before reacting, I stop to ask myself what the context of the other person may be, and I try to put myself in their shoes. I seek what we have in common, rather than how we are different. I pay attention to my deeper being, the one that exists independently of what I do or what I own. I seek how the opposites are part of the same coin, and so in myself too, what I reject most is equally a part of me. I ask for help and I provide help, I create space for collaboration. I recognize myself as part of nature, and so are all people and everything around me. I explore my own emotions and take charge of them. I am grateful for, and acknowledge, what others do. I recognize my own limitations. I view problems, failures and “difficult people” as opportunities for me to learn. I recognize fear as the emotion behind hate. I seek ways of being intentional in my contribution, and new ways to multiply this perspective.